For over thirty years, Dalal Associates CPAs P.C. has been providing personalized financial guidance to individuals and businesses. It is our mission to help clients navigate their current financial issues, while taking a proactive approach to achieve future goals. In achieving our mission we ensure that open communication is available in order to reach an understanding of each of our clients' needs. Our partners are always directly involved with our clients to provide efficient research and sound analysis. Dalal Associates CPAs P.C. is dedicated to meeting these goals with high standards of excellence and professionalism. Our unwavering dedication to our clients' unique needs has earned us the recognition of the business and financial community that we are proud to be a member of. We believe this to be a derivative of our growing portfolio of diverse clients and our focus on timely communication. 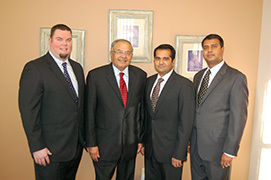 At Dalal Associates CPAs P.C., we are completely dedicated to our clients  their success is our success. Mr. Dalal founded Dalal Associates CPAs P.C. over thirty years ago and is the managing partner. He has been practicing in the field of public accounting since 1965 and is also a Chartered Accountant from India with an extensive background in law. Peter received a Masters Degree in Accounting from Long Island University and was admitted to practice public accounting in New York State in 1978. Prior to starting Dalal Associates CPAs P.C., Peter was a partner at the Manhattan based firm, Miller & Miller. In over 40 years of practice, Mr. Dalal has accumulated an extensive background in various fields and industries. His areas of concentration, other than accounting, are taxation, business planning, mergers and acquisitions, estate planning, foreign accounting matters, succession planning, asset protection and executive compensation plans. He is a member of the American Institute of Certified Public Accountants, and New York Society of Certified Public Accountants. Arish Dalal has been a senior partner at Dalal Associates CPAs P.C. since 2005. He received his Bachelor of Arts, with a primary focus in accounting, from the State University of New York at Binghamton in 1998. He was later admitted to practice public accounting in the State of New York in 2004. Arish works hand in hand with individuals and business owners in order to properly assess the services they require. He has developed extensive knowledge and experience in: aiding start-up businesses and entrepreneurs, individual taxation, real estate transactions, business transactions and business planning and development. Michael Wasileski, a partner at Dalal Associates CPAs P.C. since 2007, has over 15 years of accounting background in New York State. Michael earned his Bachelors of Science in Business Management from State University of New York at Stony Brook and was admitted to practice public accounting in the state of New York in 2006. Michael has insightful knowledge regarding both corporate and individual accounting matters. Along with general accounting expertise, Michael has extensive experience and knowledge with not-for-profit accounting, sales tax matters, gift tax preparation, foreign tax matters, 401(k) audits, and business planning. Keenan Dalal has been with Dalal Associates for over 10 years and became a partner in 2010. He received his Bachelor of Science from Bentley University in 2005 and his Masters of Science in Taxation in 2006. Prior to joining Dalal Associates CPAs P.C., Keenan worked for Price Waterhouse Cooper in their corporate tax division where he was an intrinsic part of tax preparation process. Keenan has brought a wealth of expertise to the firm with specializations in business strategy and planning, audit and review, corporate structuring, mergers and acquisitions as well as real estate transactions. Keenan is licensed to practice in State of New York as well as State of Florida. Peena has been an associate at Dalal Associates CPAs P.C., as well as the office manager, for over 22 years. She possesses extensive knowledge in accounting, bookkeeping, cost accounting, personal and corporate income tax preparation, and human resource management including NYS Labor Law Regulations. Prior to joining the Dalal Associates CPAs P.C. team, Peena had 13 years of experience working with a large corporation as the human resources office manager. Peena works with our clients to provide them support in the day to day operations of their business. Her extensive background in payroll, bookkeeping and management makes her an invaluable resource for clients to utilize. Neetu joined Dalal Associates CPAs P.C. in 2004 after attending Baruch College's Zicklin School of Business. She later graduated from SUNY Old Westbury with a Bachelor of Science in Accounting. Prior to joining the firm, she was a bookkeeper at a Home Healthcare placement agency where she assisted the Controller with the day to day financial operations of the business. Since joining the practice, she has gained comprehensive knowledge of payroll taxes, sales and use tax, multi-state compliance, spot audits to ensure that the internal controls are being properly enforced, individual and corporate taxation and has specialized knowledge of compilations, reviews and audits, and review and restructuring of financial reporting. Neetu frequently works with many of our clients' onsite as an independent controller. She brings with her a wealth of knowledge to our clients' place of business which allows her to carefully monitor day to day business transactions in order to get a deeper understanding of our clients' needs. Neetu is currently working on receiving her CPA licensing from the State of New York. Arif Hussain has been a valuable part of Dalal Associates CPAs P.C. following his graduation from Brooklyn College in 2009 where he received his degree in Business Management and Finance. Prior to joining Dalal Associates CPAs P.C. Arif worked as a bookkeeper at a wholesale perfume company where he oversaw the day to day operations of the company. Arif possesses a wide array of expertise, specializing in compilation of financial statements, personal and corporate taxation, sales and use tax, payroll taxes, formation of corporations and LLCs and a deep knowledge of general accounting practices. Arif is now a licensed CPA in the State of New York and a valuable member of our team. Vivek has been with Dalal Associates CPAs P.C. for the past 10 years after attending Franklin & Marshall College. He has an extensive background in personal and corporate income tax preparation with a thorough understanding of offshore compliance and tax filings for clients residing both domestically and abroad with foreign held assets. Vivek efficiently works with clients in assisting them to organize their offshore holdings in order to ascertain which federal and state statutes apply to them specifically. Additionally, Vivek has a background in corporate accounting, estate planning, gift tax return preparation, trust return preparation and taxing authority inquiry resolution. Sid has been with Dalal Associates CPA’s P.C. since June of 2015. Before joining us, he worked for HSBC Bank as a Relationship Banker in Nassau county of Long Island. He has Bachelors degree in Accounting with Honors and a Bachelors degree in Mathematics from Queens College of CUNY. He had passed all four parts of the CPA exams prior to joining our firm and had also worked at a small accounting firm on a part time basis to gain practical knowledge. Since then he has been working with our firm on a full-time basis and has gained tremendous knowledge in both corporate and individual taxation. Sid is now a licensed CPA in the State of New York and a valuable member of our team.